Club Penguin Cheats by Mimo777 Club Penguin Cheats by Mimo777: Penguin of the Week: Lost Dragon! Check it out! 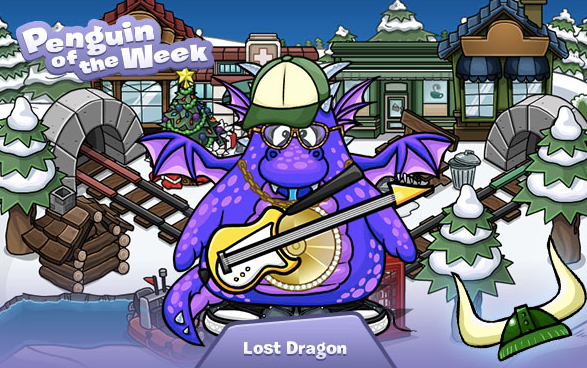 Lost Dragon is this weeks POTW! He has received a green viking helmet too! Awesome! Nominate penguins! How does this guy deserve POTW? All he did was decorate his igloo and dress up as a dragon. There are FAR more deserving people that are nice that should take his place instead, seriously. POTW for wearing a dragon costume? Hey, watch me get POTW and waste s spot for someone else far more deserving just for dancing cause if wearing a dragon costume isn't inspirational enough, then I might as well dance with the Gingerbread costume and Daffy or whoever does POTW will make me POTW just for dancing with a Gingerbread costume without doing any good deeds.